I don’t know if anyone else has noticed, but Gmail has slowly been shifting everyone’s layout from their old standard one to their new look. I hate it. 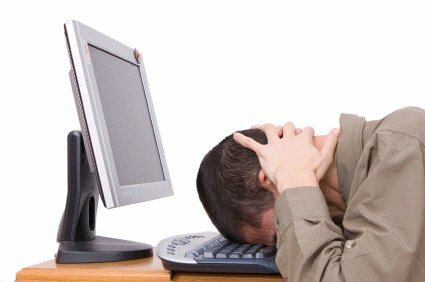 This is me after using Gmail's new layout for five minutes. Now, I’m not any sort of Google hater, but in all credit to them, they managed to produce possibly the most annoying layout for their webmail access I’ve ever come across on any webmail service and that’s up against some pretty stiff competition. It’s less pleasing on the eye, more difficult to navigate, slower to work your way around and there’s almost no way to configure it all to ameliorate any of the things that really irritate me about it. Admittedly, what works in terms of UI design is a very personal thing – what one person will love another will hate, but there are some commonly held beliefs amongst Developers with at least a tiny clue about user interfaces. Google claim that they are bringing focus “to what matters to you”. Oh really? Well Google, here’s what matters to me… I get emails – a lot of them and I user filters to archive stuff out of my Inbox so I can clearly see how many emails I have from different people, companies and mailing lists. Now that you’ve made my Labels list “elastic” I can’t see them all at once any more. Y’know, like I used to be able to? Why can I have 50 – or 100 if I really want to – rows of email Subjects on my Gmail page, but only the first eleven of my Labels? Yes, I know I’m using a tiny-screened 10″ Asus Eee PC netbook, but that still doesn’t excuse stupid layout design; if you think I have enough brain cells to be able to scroll down the emails in my Inbox, why not leave all of my Labels clearly visible in one long column so I can scroll down through them too? I used to be able to get to a specific set of labelled emails by scrolling down the page, finding the label, pointing and clicking on said label. Now, I have to point my mouse at the left hand column where the labels are, pause for about a second until the scroll bar mysterious appears out of nowhere to let me navigate as if it’s doing me a favour, then I have to scroll down the list, find the label and click on it. Oh yes, nearly forgot; if I scroll to the bottom of the list of labels, it bounces me back to the top of the list again. Tell me Google, which one of those sounds less complicated and hassle-free? It rather ruins your claim to be trying to make gmail “effortless” and yes, that’s a direct quotation. I nearly choked on my coffee the first time I read that statement. Now, I’ve been using the Internet for a good couple of decades now so I know what works and what doesn’t. In fact, I’m currently earning a living testing web interfaces at least some of the time as a Testing Professional. I don’t know what Google’s design and QA processes are like, but I personally think they dropped the ball on this one. I’d be more than happy to offer my expertise and services to gmail to help them fix it; hell, I’d do it for free just to have a less irksome user experience. This entry was posted in Uncategorized and tagged Google, human stupidity, web design. Bookmark the permalink.